I seem to know two young people studying to be pharmacists, and two inspirational images of pharmacy inspired interiors came across my desk recently -- I thought budding pharmacists would be as interested in old fashioned, romantic, pharmacy inspired living as I am in difference engines and abacuses. 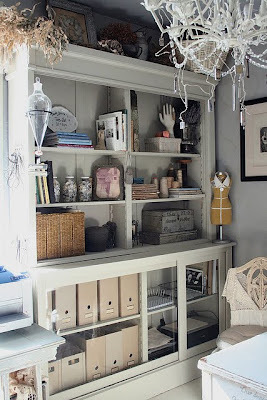 Here's the first -- the creative workspace of Elizabeth Maxson, featured in Where Women Create, May 2010. 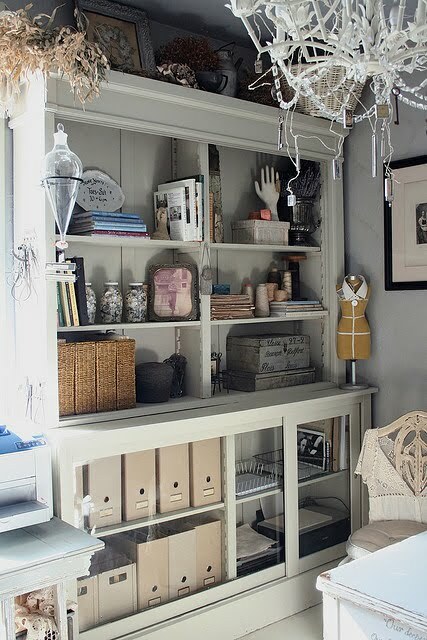 She uses a painted drug store cabinet to hold all of her supplies (above). 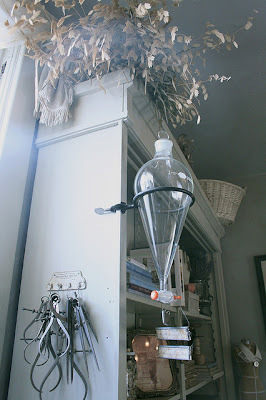 I love this dispensing decanter -- Ben thinks we ought to use a collection of these to set up a bar! 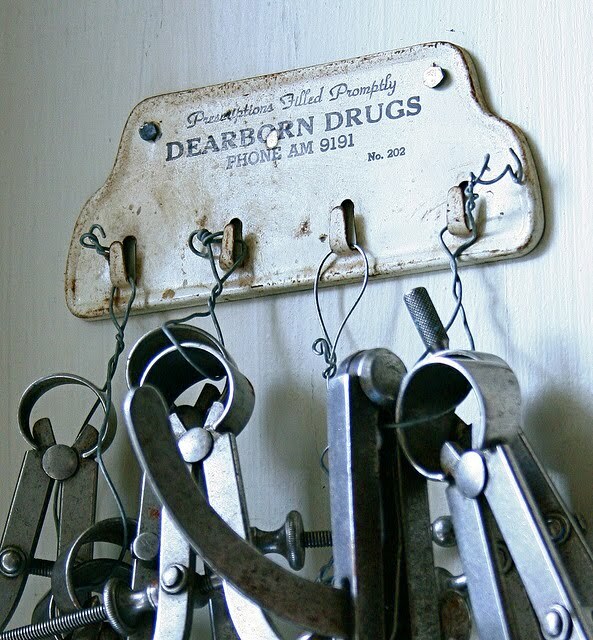 An old drugstore sign... with calipers hanging off of it! I LOOOOOOOOOOOOOOOOVE the drug store sign. This is really cool decor!! My dad was a pharmacist. He's retired now. But I remember the old drug store and all the cool things in there. I never thought of decorating with that in mind. Very cool! Steampunk in white - beautiful! Definitely digging the idea of starting a bar that uses separatory funnels and other antique chemistry glassware, like beakers and erlenmeyer flasks, for storing and dispensing liquor. Maybe even utilize them for a functioning moonshine still on display. Hmmmm... yessss. I love the way old chemistry/pharmaceutical glassware looks and the scientific vibe it gives. I have a good bit but am still deciding how to display it...Transylvania Gentleman, if you get that bar going don't forget to send pics--and invite us! It would be lovely! I do use glass laboratory beakers as drinking glasses - I have a smallish collection of medicine glasses in leather cases - they make rather lovely travelling shot glasses! Thanks for showing my office - I stumbled across your blog and love old pharmacy stuff! I have a huge pharmacy cabinet with tons of drawers that I use in my dressing room. And I have many pharmacy bottles in my old doctor's cabinet that I use as bud vases now and again.